^ D. Mihalas. Galactic Astronomy. W. H. Freeman. 1968. ISBN 978-0-7167-0326-6. ^ Hubble and Galaxy Zoo Find Bars and Baby Galaxies Don't Mix. Science Daily. 16 January 2014. ^ R. A. Benjamin; E. Churchwell; B. L. Babler; R. Indebetouw; M. R. Meade; B. A. Whitney; C. Watson; M. G. Wolfire; M. J. Wolff; R. Ignace; T. M. Bania; S. Bracker; D. P. Clemens; L. Chomiuk; M. Cohen; J. M. Dickey; J. M. Jackson; H. A. Kobulnicky; E. P. Mercer; J. S. Mathis; S. R. Stolovy; B. Uzpen. First GLIMPSE Results on the Stellar Structure of the Galaxy. The Astrophysical Journal Letters. September 2005, 630 (2): L149–L152. Bibcode:2005ApJ...630L.149B. arXiv:astro-ph/0508325. doi:10.1086/491785. ^ Loveday, J. The APM Bright Galaxy Catalogue. Monthly Notices of the Royal Astronomical Society. February 1996, 278 (4): 1025–1048. Bibcode:1996MNRAS.278.1025L. arXiv:astro-ph/9603040. doi:10.1093/mnras/278.4.1025. ^ Dressler, A. Galaxy morphology in rich clusters — Implications for the formation and evolution of galaxies. The Astrophysical Journal. March 1980, 236: 351–365. Bibcode:1980ApJ...236..351D. doi:10.1086/157753. ^ A mess of stars. [11 August 2015]. ^ Gonzalez, Robert T. Hubble Has Spotted an Ancient Galaxy That Shouldn’t Exist. io9. 19 July 2012 [10 September 2012]. ^ A spiral home to exploding stars. ESA / Hubble. [2 April 2014]. ^ Lin, C. C.; Shu, F. H. On the spiral structure of disk galaxies. The Astrophysical Journal. August 1964, 140: 646–655. Bibcode:1964ApJ...140..646L. doi:10.1086/147955. ^ Henbest, Nigel, The Guide to the Galaxy, Cambridge University Press: 74, 1994, ISBN 9780521458825, Lin and Shu showed that this spiral pattern would persist more or less for ever, even though individual stars and gas clouds are always drifting into the arms and out again . 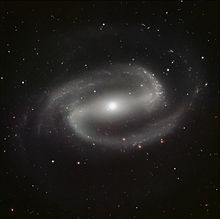 ^ Francis, C.; Anderson, E. Galactic spiral structure. Proceedings of the Royal Society A: Mathematical, Physical and Engineering Sciences. 2009, 465 (2111): 3425. Bibcode:2009RSPSA.465.3425F. arXiv:0901.3503. doi:10.1098/rspa.2009.0036. ^ Freeman, K. C. On the Disks of Spiral and so Galaxies. Astrophysical Journal. 1970, 160: 811. Bibcode:1970ApJ...160..811F. doi:10.1086/150474. ^ NASA - Hubble Views the Star That Changed the Universe. ^ Hubble, E. P. A spiral nebula as a stellar system: Messier 33. The Astrophysical Journal. May 1926, 63: 236–274. Bibcode:1926ApJ....63..236H. doi:10.1086/142976. ^ Chen, W.; Gehrels, N.; Diehl, R.; Hartmann, D. On the spiral arm interpretation of COMPTEL 26Al map features. Space Science Reviews. 1996, 120: 315–316. Bibcode:1996A&AS..120C.315C. ^ McKee, Maggie. Bar at Milky Way's heart revealed. New Scientist. August 16, 2005 [17 June 2009]. ^ Thomas, Sunil. Potassium sulfate forms a spiral structure when dissolved in solution. Russian J Phys Chem B. 2017, 11: 195–198. doi:10.1134/S1990793117010328. Giudice, G.F.; Mollerach, S.; Roulet, E. Can EROS/MACHO be detecting the galactic spheroid instead of the galactic halo?. Physical Review D. 1994, 50 (4): 2406–2413. Bibcode:1994PhRvD..50.2406G. arXiv:astro-ph/9312047. doi:10.1103/PhysRevD.50.2406. Stephens, Tim. AEGIS survey reveals new principle governing galaxy formation and evolution. UC Santa Cruz. March 6, 2007 [24 May 2006]. （原始内容存档于2007年3月11日）. 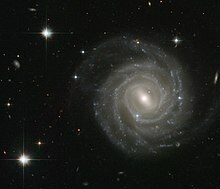 SpiralZoom.com, an educational website about Spiral Galaxies and other spiral formations found in nature. For high school & general audience. Merrifield, M. R. Spiral Galaxies and Pattern Speed. Sixty Symbols. Brady Haran for the University of Nottingham.